Global sporting goods manufacturer Wilson Sporting Goods Company introduced a new line of high-technology performance tennis rackets that were field-tested in the School of Kinesiology’s Human Sensorimotor Control Laboratory (HSCL) directed by Jürgen Konczak, Ph.D. The participants were experts recruited from the U of M varsity tennis men’s and women’s teams, and testing took place at the U of M Tennis Center. U of M varsity tennis player monitored by HSCL. In tennis, the ball hitting the racket during tennis strokes induces a vibration of the racket frame, which transfers to the arm of the players. High vibration transfer may cause discomfort, induce earlier onset of fatigue and, with repeated exposure, increases injury risk. A racket design that can effectively reduce vibration transfer from the racket to the player’s arm should mitigate these negative vibration effects and aid to stabilize or improve a player’s performance. Thus Wilson used Countervail technology, a one-of-a-kind layered carbon fiber that was originally designed for the aerospace industry to dissipate vibrational energy in airplanes. Strategic amounts of this material were incorporated into their new Blade performance tennis racket. HSCL measured the vibration in the rackets and determined how much these vibrations transferred to the arm, then compared the vibration behavior of this new design to another commercially available racket. 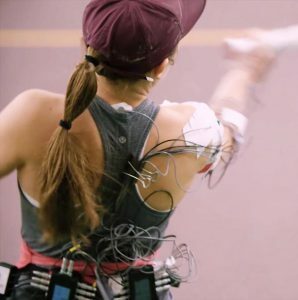 In addition, the electrical signals from several arm muscles were recorded during the play to obtain electrophysiological markers of muscle fatigue. A main finding of the study is that the new Countervail technology effectively reduces the vibration at the racket, which potentially can help players play longer while maintaining the precision of their strokes. Read about the announcement on the 10sBalls.com blog. HSCL Tennis Racquet Study – 20161209 from CEHD Academics on Vimeo.